As part of MIFTAH’s project “Supporting Young Palestinian Women Leadership: Voices for Change” carried out in conjunction with the US Consulate General in Jerusalem’s Public Affairs Office, MIFTAH organized a series of training sessions for three groups of young women in various parts of the West Bank. The trainings were focused on capacity-building skills in dealing with the media, pressure and advocacy in addition to networking, alliance building and communication. They also focused on leadership skills and public speaking all in order to utilize these skills in three youth initiatives on violence against women, namely sexual harassment. The following interview is with one of the participants, Inas Allan. Can you tell us about yourself and how you became involved in MIFTAH’s activities? I am 21 years old and I live in Jerusalem. 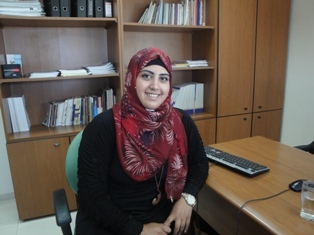 I study community service at Al Quds University and see myself as a community activist. I have volunteered with many organizations such as MIFTAH, Sawa, and the Jerusalem Center for Women. I became involved with MIFTAH at the start of 2013 and I hope that this involvement can continue since I feel I am learning so much from it. The name of the project is: “Young women leaders” and is based on initiatives put forth by young women who are active in their communities and then implementing these initiatives. So far, I have completed three training courses in media, advocacy and networking. As for our initiative, we are a group of young women who are carrying out an initiative to combat sexual harassment entitled “No to Harassment”. We plan to hold several activities. First, we plan on holding public meetings in universities (Birzeit, Al Quds, Al Quds Open University in Jericho) along with several institutions including MIFTAH. The meetings will discuss the issue of harassment from a legal, religious and social standpoint. We are also hoping to involve actual cases of harassment. At the end of the meetings, we would have devised messages that we will convey during a protest in front of the governorates of the three cities we are in, demanding that solutions be found to the problem by enacting laws that punish offenders. In other words, we will call for the revival of the role of the security services and authorities in combatting this problem. We also plan to print posters on the subject and to create a short video with our message, which we can show at universities and via media outlets. What kind of response do you expect from the public to such a sensitive subject? We expect to ruffle a few feathers since it is such a touchy subject but we hope we can convey our message as properly and efficiently as possible. How has this project made a difference on you personally? It has had a huge impact on me actually, especially because it intersects with my major, which is community service. In the practical sense, I am carrying out a complete initiative before I graduate, which means I would have acquired important experience that will open future doors for me . I feel I am ready to head any initiative and oversee its implementation. My volunteer work has helped with this sense of preparedness too. I believe community and volunteer work helped to develop my character; I am a strong believer in that change must start from the person themselves because if we don’t change ourselves, how do we expect to change society? I would like to add that MIFTAH has had huge impact on me personally and on the ground in Palestine; people know it, partly because it does not drop them after the training ends. MIFTAH follows up with us as we implement our initiatives and ideas and this is what sets it apart from other organizations. It has been a pleasure working with MIFTAH and I hope to continue this collaboration in the future.